In the future, will your post box be transformed into a drop box for your medicines, delivered by drones? Perhaps you will have an anti-slouch screen device that will alert you when you need to change position or take a break from your computer? Will tiled floors in areas where many people pass contain microchips and shock absorbers to harness the kinetic energy and generate electricity? 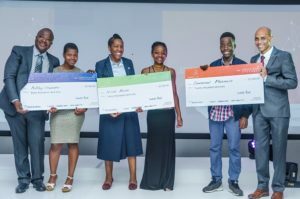 These are but some of the ideas presented by the 30 finalists at the 2017 Junior Innovators Competition (JIC), hosted annually by Investec since 2012. Grade 11 learners were eligible to enter after completing the 20-week JA South Africa flagship Entrepreneurship Academy Programme or the 12-week Enterprise Programme. Both provide experiential learning where students develop a business from concept to production. 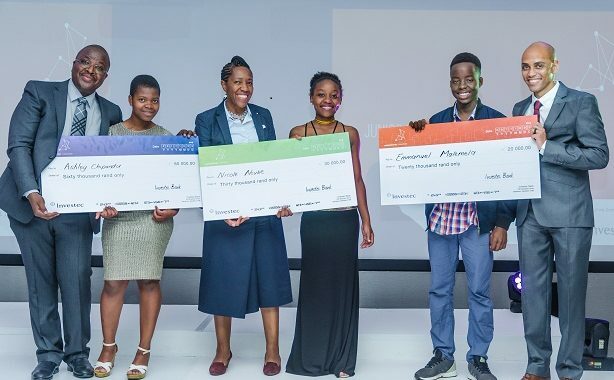 Of the 200 learners who submitted applications, 30 were chosen to attend the week-long boot-camp of business, marketing, innovation, presentation and life skills workshops at the Investec Sandton offices from 30 September to 6 October. Throughout the week the learners were assigned a volunteer mentor to work with them in building a business case. After long days of seminars, students worked late into the night to fine-tune their presentations, with their dedicated mentors unwaveringly by their side. Then the final day of judging dawned, with three panels of judges listening to three groups of students. The judging criteria for the winners was based on their participation throughout the week in the workshops, social media votes and their presentations. The final ten were selected and they presented to a final panel of judges. At last the winners were announced. In first place was Ashley Chipandu, from Lamula Jubilee Secondary School in Gauteng, for her concept of a blue-tooth earpiece that can be connected to the shoe of a visually-impaired person. Using electronic waves the sensor would be able to detect obstacles and alert the user so as to avoid bumping into them. Nicole Ncube, from Tsosoloso Ya Afrika Secondary School in Gauteng, came second with her Urban Pill Distribution (UPAD), an app that schedules collection and notifies people to pick up medication at the clinic. Then people would no longer have to stand in long queues or run the risk of returning home without having been helped. This app would also ensure that people’s data does not get lost. Her plan for phase two is to introduce a panic button for elderly people and those with chronic illnesses. Emmanuel Matamela of Sandtonview Combined School, also in Gauteng, took third prize for his idea of linking traffic spikes to traffic lights in areas of high congestion with high level of traffic accidents, which are often caused by violating the rules in regards to traffic lights. The winners were announced and celebrated at a gala dinner the evening of Thursday 5th October at the Investec Sandton offices. Respectively they won R60,000, R30,000 and R20,000 towards tertiary studies. Congratulations to the winning trio!